Cheers No idea why that happened. No problem I'll be uploading another game soon. I've just uploaded " CoolBox " and a new version of " Jewel Warehouse " to the wiki page. You can now Pause with Joypad Button 2, unpause with Button 1, Quit with console pause button. I'll upload the next game I'm working on asap.
" Crafton & Xunk / Get Dexter "
Joypad 1 Button 1 to pass title screen. Language select screen options, Left = French, Joypad 1 Button 1 = English, Right = German. Use Joypad 1 LEFT and RIGHT to Select control option 1 or 2, Joypad 1 Button 1 to Begin Game. The version of " Crafton & Xunk / Get Dexter " that I first uploaded above gives corrupt graphics for some reason. I've now done a new version which appears to be ok, grab the new version above or on the wiki page. For the people want play galaxy force normal withouth pokes. The people only want view the game with the pokes to the finsih can use the other cartridge with broken return. (with inifinite fuel poke yo don't die and you dont return). Hello, is there a "How to" for finding the used Keys in Games? I tried converting Scramble Spirits to a CPR, but failed with the Keys in the Main Menu. I tried finding the keys using Winape, but failed. Maybe someone can throw me in the right direction? I remember this game i think i have it on tape. is a speccy port. Not exist a guide because every game and cracker is different. Anyway if you use the bmc version is uncompressed. with the winape debug breakpoing->add input/output breakpoint "keyboard read". 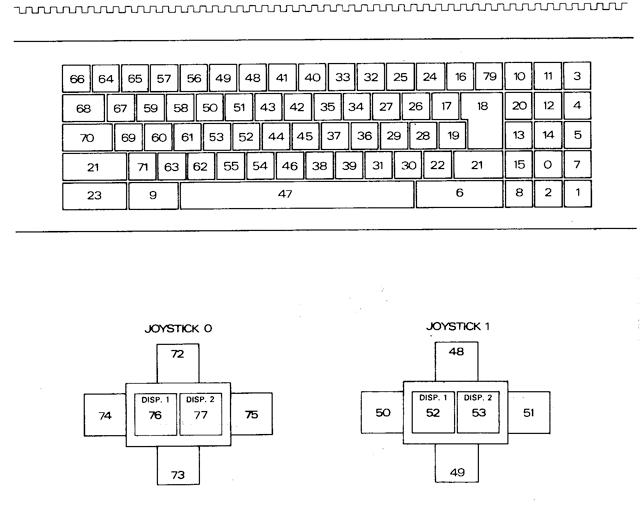 The instruction in &900 bit x,a sounds familiar to comparing the bit x of x line of the keyboard. So go to the ret in 0904 and made step in to make the program return the direction where the call is called. That reveals a structure tipe ld A,x call &085c from &5a31-5a56. A l'écran du choix des contrôles pour le Player1 et Player2 enfoncer simultanément les touches O+M (Clavier QWERTY - aucun son ou message ne viendra confirmer la bonne activation du cheat mode)"
Probably is the M of the cheat code. Search in the hex editor the hex code of the call and the a.
subtitute in the hex editor the 26 to 4c(joypad fire 1) for example. save the dsk in the editor and try the changes. early of that you can try the changes directly modifing the memory in the winape withouth the hex editor. In the Y/N trainer selection. Make a breakpoint in &bb00 to bb4e(in all rst 08) view the first item stack(the direction where the calls return after finished).. So when a key is pressed it return the code to a register. For example the &a22a cp 59 is =89 in decimal= "Y". The keypad 1 fire 1 and two are interpreted by the firmware as "X" and "Z", so change the cp codes to these letters make the work. In the crak intro, using the winape breakpoint keyboard. Is a standalones subrutine. So. In 4ccd looks to cp 7f=01111111 in binary. space is in line 45 bit 7 in the keboard matrix. So is necesary change the cp to the pad1 fire 1 pressed. calculting it in binary and hex. But pad1 fire 1 is in line 9 not the line 5 where the space is . So you need locate the 45 and change to 49.
thanks for the big explanation. I can follow the process and it clears a few questions. The Cheat ( Trainer ) gives infinite Lives for both Players. Press the Console Pause Button on the screen with " Press Fire To Start " in the middle to activate the inbuilt cheat, this appears to only work with Player one though. ¿Does it have the Game Over problem fixed? Yes, the no poke is another diferent crack and the game over is fixed. Titus the fox, add password compatibility for gx4000. left to do add the up,down left right center screen in pad two if the people want it. .
Is great have another new porter. if you need help with a stuck thing. You can ask what you need. yes raid works, but you miss the opportunity to press ESC and go to next level if you get one or more plane out of the hangar. There is no need to bring all plane out. I've done some more work on " Raid Over Moscow "
The game is Joypad only now, ESC mapped to Joypad 1 Button 2 to address the above issue. You can also press the Console Pause Button to Quit game. What is more preferible, depart level works only one time and when you die you return to level one, or al ways returns to the choose depart level.? this appears to only work with Player one though. i don't understand, are there two CPRs or the pokes are selectable somewhere ? By the way, it hangs on title screen on both my GX4000 and emulators, unless i missed the way to launch the game. Everything else (except Galaxy Force) upped to the wiki, including Barbar demo (the conversion by devilmarkus cause the grim one is locked at launch screen). Thanks for adding the games to the wiki page, I'll add comments to the page. Here is " Scramble Spirits ". The Trainer cheat when you first load the cart gives infinite lives to both players, however, if you use the inbuilt cheat that gives invulnerability, then it will only work on player one. It works in my emulator when i try it. I chek it when temperature go dow to swith on the pc. Is suposedly one version have pokes. With freeze if you not use pokes. And the other version not have pokes but it not freezes. How do you launch a game. What do you call "a return" ? So, where is the other version ? Ururgi cpr only stuck when you not use pokes, because it only happend when you die. This not stuck. It Return to main menu. And the game not have pokes. I dont remember now how i execute it, because i try it weeks ago.. Seems like the Urusergi's version works quite ok, even without pokes. It does some strange things at the game over, but will eventually end up to reset to the screen where you select pokes or no pokes. That's right that sometimes you get stuck in a loop where you are sent to the next mission and immediatly you're out of fuel. I had that 1 over 5. Do you think we should promote it working ? I have a C4CPC and now I am a child again. In the converted games' page says to reporting here the problems not detected, so here I am. I'm trying to play Batman, of Ocean (1986), and I can't get any object, so I can't go very far in the game. Maybe there is no a button for this function (I think was the "enter" button in my old cpc464). I tried with both gamepads. Thank you for all your work. It makes happy people like me. Page created in 0.216 seconds with 98 queries.